Touch, hear, smell and taste. These are the four senses that used to guide blind couple Eva and Jocelino. However, five years ago things began to change. After seven years of trying, Eva became pregnant with a boy. Her sight obviously did not return after giving birth to young Pedro – but it did in a way. Being a parent is one of the hardest tasks in life – but a truly daunting mountain to climb when you are blind. “You obviously need help, everyone does. My mother did help me for the first weeks, and I had attended a course that taught me a few tricks. I learnt that to give medicines, for instance, we have to first pour it in a glass and pay attention to the sound”, she explained. “Also, every time he cried I could tell whether it was cramps or something else, just like any other parent do with their newborns”. Husband Jocelino, 41, agrees. He says their son Pedro is a gift from God, who has given a new meaning and sense to life. And by sense, he means it literally. 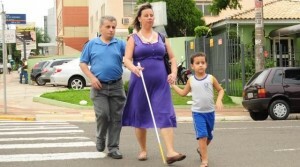 Pedro has grown to become mom and dad’s eyes – he is the one who guides them through the streets of their city, in the western part of Brazil. He quickly grasped the fact that his parents could not see, and naturally plays his part in the family. To Pedro the fact that his parents are blind is totally normal. Eva and Jocelino said they always try and be careful not to let their “limitations to turn into a burden for the boy” but, as any of his peers, Pedro has to follow all the rules set by his parents. They are in charge. For this couple, the opportunity of being a parent was more than a dream come true. It was their chance to experience feelings beyond the sight. And more than that, they showed that being disabled does not mean being incapable of having a child on their own. They might not know what their own son looks like visually – but having him in their lives have taught them to ‘see’ the world in a different light. “The first real visual contact I have ever had was through him. It was fascinating. Only then could I realise how important it is to be able to see”, said Eva. “He fills up this empty space we used to have in our life”, concluded Jocenildo.